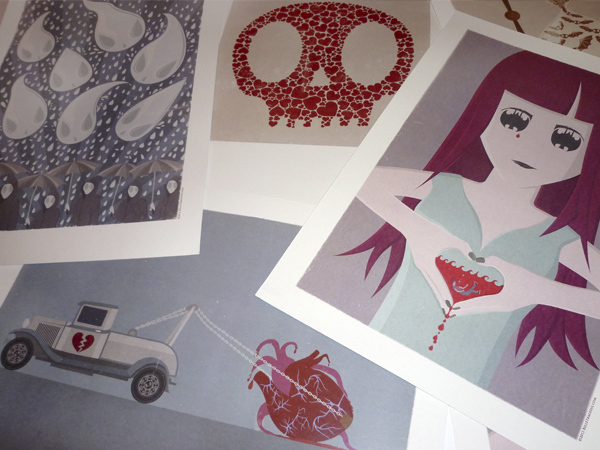 Things have been pretty busy at Belle Tragedie HQ recently, mainly DIY work and entertaining my cat, but I’ve finally got round to getting some new prints to sell in my online shop. I love getting printed artwork and promotional stuff delivered. It’s like Christmas!! Aswell as the prints, I’ve given the online shop a bit of a refresh, just to bring it more into line with the main site. I prefer to design websites rather than code them but I do enjoy learning how CSS works, even though it has me tearing my hair out at some points. I can be sat for hours trying to work out why something is floating in the air somewhere, only to find I’ve deleted a </div> by accident. Stupid divs. I hate divs.